Wales' injury setbacks could work in their favour by causing teams to underestimate them in the World Cup, says former captain Gareth Thomas. Goal-kicking full-back Leigh Halfpenny and scrum-half Rhys Webb, both 26, are out of the tournament with injury. British and Irish Lions scrum-half Mike Phillips and Ospreys wing Eli Walker have been drafted back into the squad. 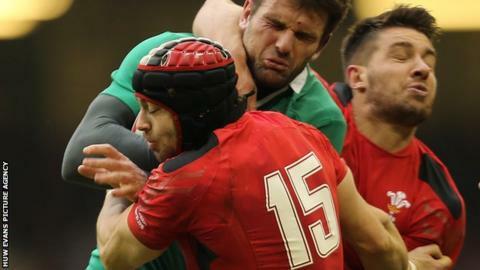 "Wales can get a lot more from these injuries than the negatives," Thomas, capped 100 times by Wales, said. "For [pool opponents] England, Australia, Fiji not to have such a focus on us, we can sneak under the radar, we can take people by [surprise] rather than people being ready for us. "I never loved it more than when I was an underdog. "We can still go and do it, we're not run by one or two players." Wales begin their World Cup campaign against Uruguay on 20 September in Cardiff, with prop Samson Lee and full-back Liam Williams likely to start after returning from long-term injuries.